Why Not Try A Fleet Pond Easter Trail? 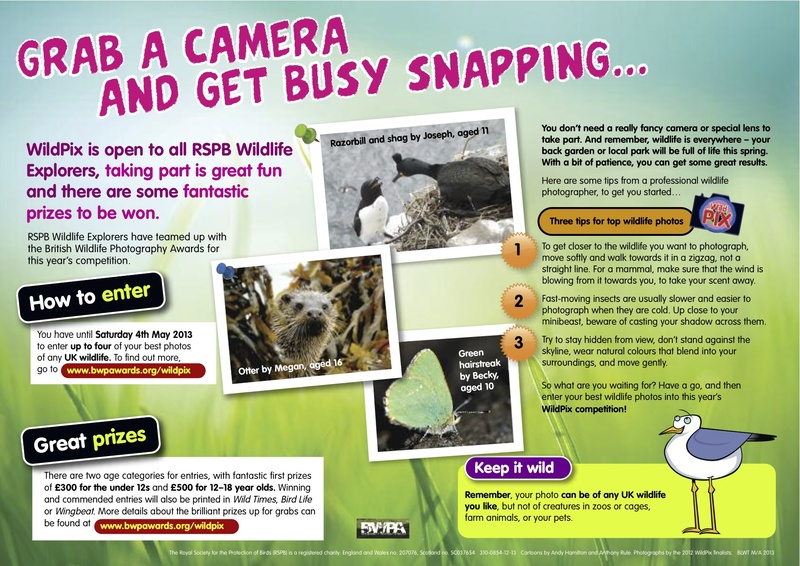 The Hart Countryside Rangers would like to invite you and your family to share our passion and excitement for the Easter holidays with our fun packed Easter trail. Explore Fleet Pond on a self guided Easter trail with questions to test your knowledge of the local wildlife, plus there will be a chance to try out some activities along the way, complete the trail and receive an Easter egg. A great way to enjoy a family walk, keeping children enthused and entertained along the way whilst enjoying the fresh air! Collect your nature trail packs from the Fleet Pond Picnic Area to start the trail (see map on About page above for location). Booking not required, drop in anytime between 10.00am – 2.00pm (last trail 2pm). £3 per trail guide (includes an egg at the end). The access track to Fleet Pond has dried out enough (after the flooding) to re-open the road. However the pot holes have become really bad (the road is scheduled to be resurfaced over the next few weeks). Consequently please drive slowly and carefully if you decide to park in the Fleet Pond Main Car Park. The picnic area will be sign posted from there. Due to the likely conditions, it would be advisable to wear Wellington boots or similar. Dredging work to deepen Sandy Bay has provided an opportunity to widen the open beach area for visitors to enjoy. 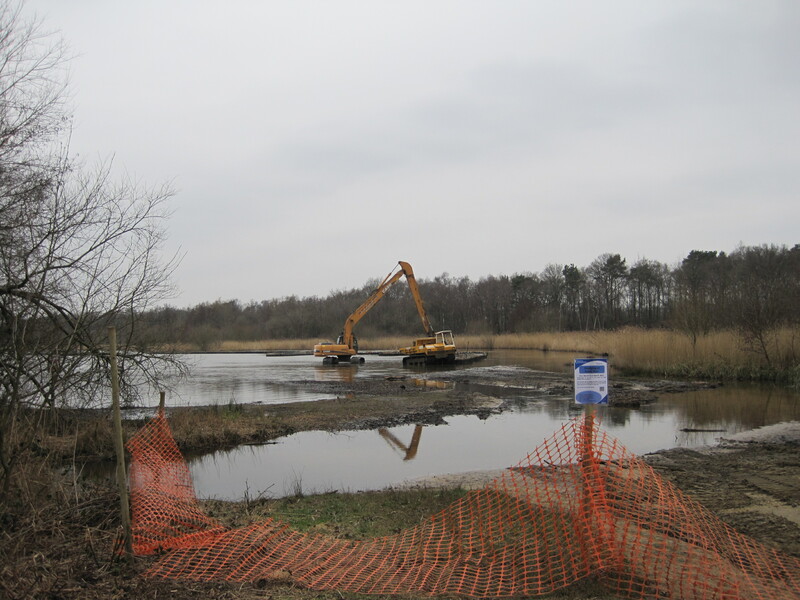 Dredged sand will be spread over the areas that have been cleared of bramble by volunteers, to give a wider beach which will have a slight gradient to allow rainfall to run off into Fleet Pond. Once the silt has been smoothed off and settled, the objective is to provide more seating and a smoother access track from the boardwalk to the seats for mobility aids (e.g. chairs) and child carriers. Some of the extracted silt will be used to repair the erosion in the main access track beside the boardwalk. We apologise for the inconvenience caused by the need to close the beach area while the work is being done. 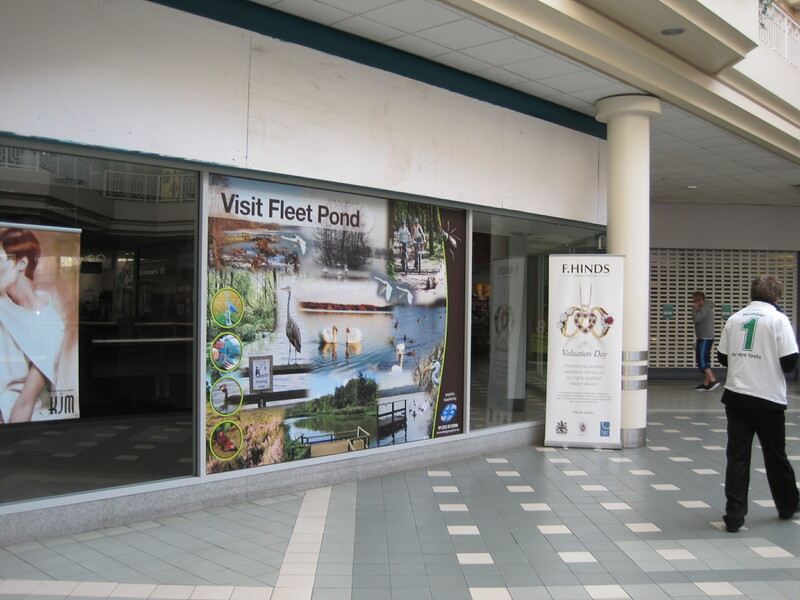 Funds for these works have been provided by Fleet Pond Society’s Clearwater Campaign. 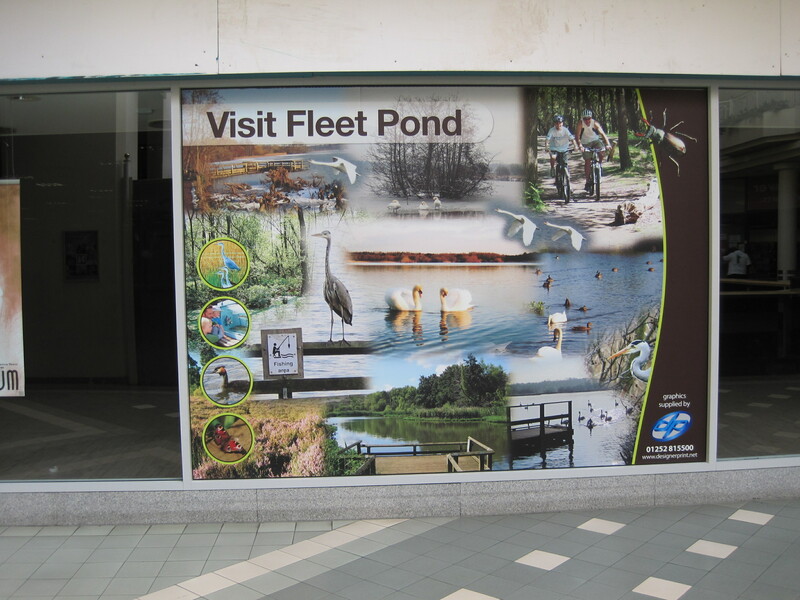 Have you spotted the impressive collage of Fleet Pond, produced by Designer Print of Fleet, in the Hart Shopping Centre? 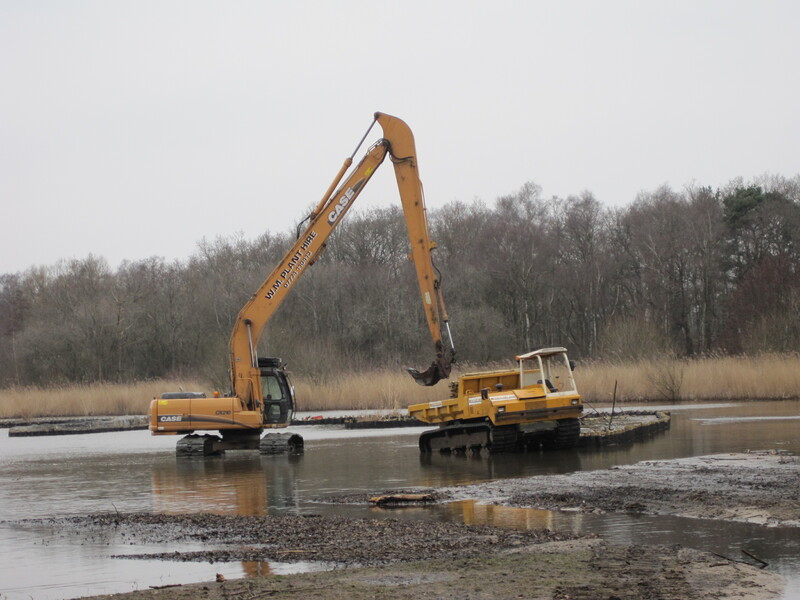 It has been necessary to provide access to Fleet Pond for heavy machinery for dredging of the lake and for dumper trucks to move extracted silt, once it has dried, for a heathland restoration programme adjacent to Bramshott Heath. Visitors will have seen the wide gravel track laid parallel to the railway line and a wide jetty at Boathouse Corner. Sadly this required demolition of a fishing jetty and removal of the recently installed History Board. 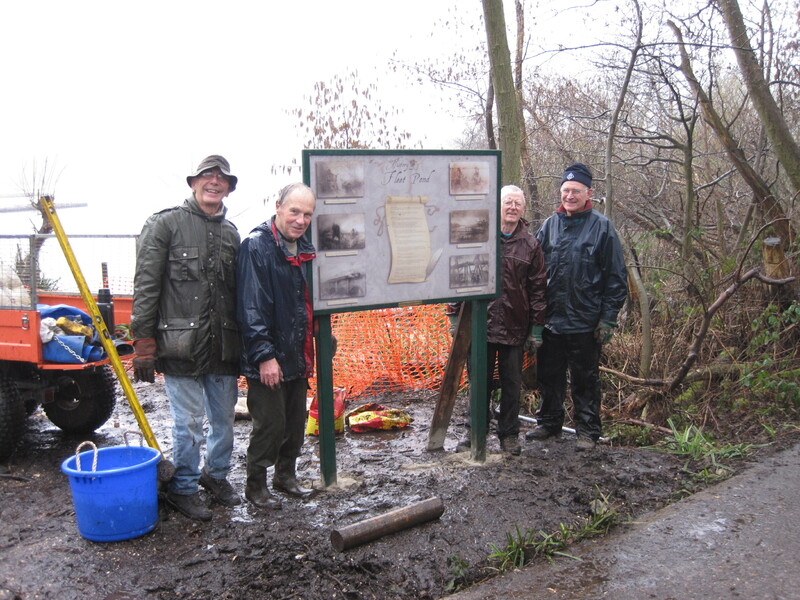 An elite team of Last of the Summer Wine (LSW) volunteers has now put the History Board back at Boathouse Corner, out of danger from the dredgers and trucks. On a very wet Friday the team dug two new holes and cemented the board in its new position (see above). In order to tidy the area (which has become rather an eyesore as a result of the works), the LSW team has ambitions to clear and level the area behind the History Board and install two new benches. Fishermen who have not been able to fish from this corner while dredging operations were underway, should be able to fish from the new, wide jetty this summer. 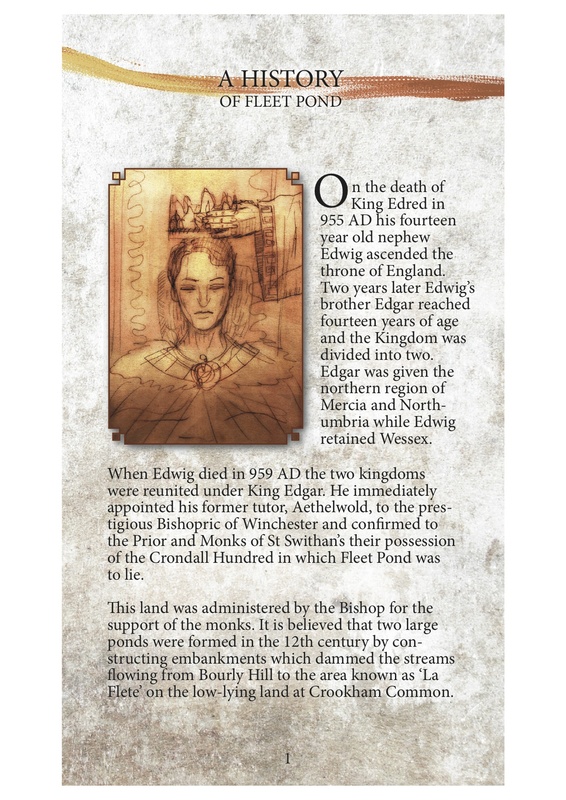 Editor: Fleet Pond Society have recently produced an attractive pamphlet (sample page below) that surveys the history of Fleet Pond. Please see here for more details and a free download. The pamphlet is also available for viewing in Fleet Library. The competition opened on 1 February 2013 and closes on 4 May 2013. Scouts Make Light Work Of The Scrub! 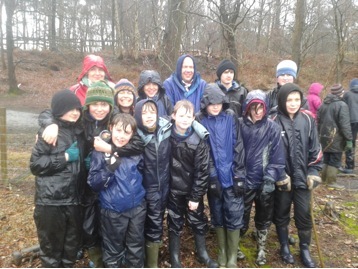 “Once again, on Sunday 10th February, 29th Odiham (Pondtail) Scouts donned their wellies to help Fleet Pond Society. It was a particularly wet Sunday and the weather tried it’s best to put us off but to no avail. The 16 strong team of scouts, leaders and parents headed with the other Fleet Pond Society volunteers to Coldstream Marsh where they made light work of the scrub! The scouts thoroughly enjoyed the morning, and, as you can see from the photograph, were soaked through by the time they finished. For more information on Odiham Scouts, please see their web site here. Odiham is one of 28 Scout Districts in Hampshire and comprises Church Crookham, Crondall, Dogmersfield, Fleet, Long Sutton and Odiham. The District membership consists of approximately 700 youngsters and adults, forming 8 Scout Groups. Odiham District Scouts are always looking for Adults able to offer their skills and time to providing quality youth activities in the District. All skills and abilities are useful. Please see their web site (above) for contact and other details. “We had a team of volunteers on Tuesday to start a clearance of Sandy Bay. There are still a few tree stumps to be removed and some gorse to coppice so we will work on that this coming Sunday. Meet at the Countryside Workshop to leave at 9.15 a.m. or come direct to Sandy Bay if you arrive a bit later. You are currently browsing the Fleet Pond Blog blog archives for March, 2013.